Dr. David B Cano, MD is a Doctor primarily located in West Palm Beach, FL. He has 30 years of experience. His specialties include Ophthalmology. He speaks English. Dr. Cano has received 2 awards. The overall average patient rating of Dr. David B Cano is Excellent. Dr. David B Cano has been rated by 8 patients. From those 8 patients 4 of those left a comment along with their rating. The overall rating for Dr. David B Cano is 4.5 of 5.0 stars. Dr Cano's caring ways of treating patients must be commended. He takes the time to explain procedures that best suits your needs. His staff from the main desk to his assistants are courteous and warm. They make you feel "You are in good hands". If you are looking for a genuine doctor who would listen, treat you with respect, who is highly knowledgeable in his field, you should make an appointment and see it for yourself. Lights were flashing in the corner of my right eye.. Excellent Doctor. Saw me on an AM emergency basis and got me to a retina specialist before noon of that day. If it wasn't for Dr. Cano, I would be blind. 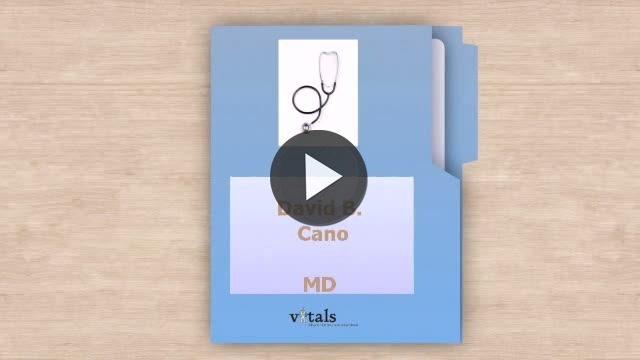 Take a minute to learn about Dr. David B Cano, MD - Ophthalmology in West Palm Beach, FL, in this video. Dr. David B Cano is similar to the following 4 Doctors near West Palm Beach, FL. Have you had a recent visit with Dr. David B Cano? Select a star to let us know how it was.